Hello and Welcome to Train Spotting World, for everyone interested in Rail Transport. Train Spotting World is what you want it to be: as all registered users can edit, you can add whatever you want about Trains! The British Rail Advanced Passenger Train, possibly the greatest disappointment in British railway development. Find out about ploughing snow: an article that includes a stack of great videos. The British National Tramway Museum, home of many trams from all over the world. Take a trip aboard the Pioneer Zephyr, one of America's greatest trains. The world's oldest operable steam loco, that also holds many other records: the John Bull. Network SouthEast (NSE) was a sector of British Rail that principally operated commuter trains in the London area and inter-urban services in the densely populated South-East of England. 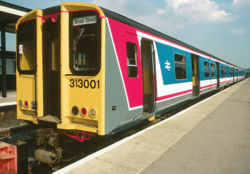 In the privatisation of British Rail on 1 April 1994 it was broken into a number of franchises. Before the sectorisation of BR in 1982 the system was split into regions: those operating around London were London Midland Region (Marylebone, Euston, St Pancras and Broad Street), Southern Region (Waterloo, Victoria, Charing Cross, Holborn Viaduct, Cannon Street and London Bridge), Western Region (Paddington) and Eastern Region (King's Cross, Moorgate, Broad Street, Liverpool Street and Fenchurch Street). This was perceived to be a source of inefficiency, so sectorisation reorganised everything into a single organisation covering commuter services. At the same time InterCity took over express services and Regional Railways took over regional services. The Train Spotting World News Service is here for anything: Whether it be last minute event details, news of Railway Operations, or simply an unusual working. Just create a new page headed "News:", and then link to it from here! The Newspaper Train has pulled into the station, and aboard it is a fresh supply of The Transport Journal! Pop to the Station News Kiosk to get your copy! Trains:Bugs and problems has been created where users can list bugs and problems related to software. The British Rail Class 37 diesel locomotives, also known as the English Electric Type 3, were commissioned as a part of the 1955 British Rail modernisation plan. In total 309 were built, with the order split between English Electric's Vulcan Foundry at Newton-le-Willows and Robert Stephenson and Hawthorns, Darlington. The Class 37 became a familiar sight in many parts of the British Rail network, for example, forming the main motive power for Inter-City services in East Anglia, within Scotland, and so on. They were relatively rarely seen on the more 'glamorous' main line expresses, but on secondary and inter-regional services they performed well for many years. In the 1980s many locomotives were refurbished, which has meant the Class 37 fleet is one of the longest surviving classes on British railways. However, the introduction of new Class 66 locomotives has meant many locomotives have been withdrawn or scrapped. The last few British examples are operated by EWS and Direct Rail Services, who retain small fleets, with several examples also operated by spot-hire companies. However, second-hand Class 37s have also proved popular in the export market, with some examples currently operating in Spain and France (serving the construction of these countries' high-speed railway networks). Did You Know that the Train Spotting World Homepage was redesigned in October 2007, and again in December 2007? Did You Know that you can now Adopt-a-User? Did You Know that there was an American Spin-off of Thomas the Tank Engine, called Shining Time Station? Did You Know that you can join a workforce and help expand some key areas? This page was last edited on 1 April 2008, at 11:35.